Can there be such an economy rooted in Christian Law wherein usury and interest is a capital crime? The Dark Ages are a most misunderstood period. Voltaire said that history is the tricks that the living play on the dead. Voltaire was right. The Establishment teaches us that the Middle Ages came just after the Dark Ages. Lots of dirt, tyranny, poverty and borderline hopeless living. Nothing could be further from the truth. The greatest displays of a nation’s wealth, its cathedrals, were built during the Middle Ages. The skilled labour used to construct the cathedrals was mostly volunteer labour. Labour was donated to the church to perfect skills, learn or upgrade new skills. How could such labour be donated? At the dawn of the age, the usurers were driven from the land. Anyone on either side of a usury contract was given thirty days to cease and desist. Failure to comply meant expulsion from the land and the denial of the right to a Christian burial. Usury dried up and blew away. In the middle of the 19th Century, Oxford Professor of Political History, Thorold Rogers wrote of that era: “At that time a labourer could provide all the necessities for his family for a year by working fourteen weeks.” The other thirty-eight weeks were his to do as he pleased. Would you like to earn all of the money required to feed, shelter, clothe and recreate your family for a year by working fourteen weeks? What would you do with thirty-eight weeks of vacation per year? The people of that age re-instated God’s Law, particularly regarding economics. They neither gave usury, nor took it. There was no chain letter money and banking system. Consequently, the lands were full of spiritual and material wealth. There was a church every four square miles throughout England and thirty-five magnificent cathedrals. Externally imposed laws were at a minimum. The church, the king, the municipalities and the guilds had limited power. The Court system evolved from the church and was separate from the government. The reason the room stood when the judge entered the court was not out of respect for the judge, it was because the judge carried the Bible onto the Bench with him. And that bible was the final arbiter of the dispute before the court. The court system, an outgrowth of the church was mostly autonomous. The church interpreted the laws. Laymen wrote pamphlets concerning economic justice. 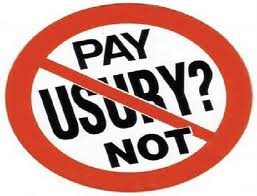 Usury was the aids of its day – economically speaking. Today these facts are hidden from us by an evolutionary, humanistic, government-save-me establishment. The Middle Ages are often referred to as the Dark Ages. And our lives today. Instead of working three days a week and having four to ourselves, we have two pay cheque familes today, where a generation ago we only needed one pay cheque to afford our common life style. Our wives must now work so we can afford what our parents had a generation ago. We flee into alcohol, professional sports, movies and T.V. We seek to escape the pressure of our due bills. 160 to 180 holidays a year to us is a foreign a circumstance as the planet Saturn and her multi-coloured rings. I am now convinced that if we as a people can abolish usury from our society as our forbearers did in Europe seven hundred years ago, we will leave our children and grandchildren a circumstance where they will be able to make a society that is prosperous and just, peaceful and plentiful. If we cannot as a people banish usury from our nation, we will condemn our children and grandchildren to a world of poverty and tyranny. It will be one hell of a fight where as Salomon P. Chase said: “The people will be arrayed on one side, and the banks on the other, in a contest such as we have never before seen in this country. Our children’s future depends on our taking up this challenge and winning. I believe that fight must originate as the American Revolution 210 years ago, in our churches. We may have to educate and train our churchmen at first. This fight must be staged and it must be won. As General George Patton said: “We will go forward and meet the enemy and be victorious or let no man come back alive.” If I didn’t think this fight could be won, I wouldn’t have written my book and created this 1988 update. Life Without Usury is transcribed from the 1988 audio cassette ‘Avoid Bank Holidays’ by Peter Jon Simpson. Religion has played an epic role in forming policies. As an anti-theist I do have a problem with using deceitful and superstitious dogma to support any cause, even a very compelling one such as this.